In It for the Win or Experience? Which is your style? Are you in it for the win or the experience? Of course we all want to win, but are we really taking advantage of opportunities to gain invaluable experience? There are many groups and organizations that encourage youth to become involved and learn to succeed. FFA and 4-H are common in Agriculture, but there are many, many others like the Beef Ambassadors program mentioned in a previous post. These groups are great for teaching youth life skills like team work, responsibility, and leadership. Parents are the driving force enabling youth to participate in these programs, and if not for their many volunteer hours, many of these programs would not exist. But are some parents pushing so hard for their children to win, that they forget about the importance of the learning experience? As a youth in 4-H I showed chickens, commercial heifers, market steers, and Angus bulls and heifers. I never did buy a club calf. All of my animals were from our family operation or purchased from neighbors. I did pretty well in the show ring and even won my class a few years. There were kids there with fitted club calves who won the show every year, but I still had a blast. Showing cattle was not a “one week out of the year” job. I loved being in the barn with my show calves so much my mother would have to call me in for supper each and every night. I could spend all day out there working with the calves, giving them (and often myself) baths, swimming in the stock-tanks (I think that is still done from time to time), and just hanging out finding things to do. 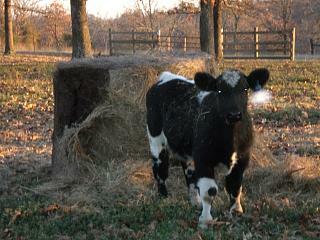 I never made money off the show calves, but my family always had a nice fatted steer in the freezer each fall. Showing calves was no walk in the garden. There were the bruised and broken toes from calves stomping on my feet. That is how I learned the hard way the importance of wearing boots around livestock. There would be a change in the weather where calves would act up one day and there were some that were ever-so difficult to halter break. I spent hours stretched out on that lead rope trying to be just as stubborn as my show steer. Breaking ice at 6 AM before school was never an enjoyable thing, but it had to be done. Neither was feeding in the cold rain or lightening storm, but I wasn’t going to let my calves go hungry. There were some tough times where I just wanted to turn the calves loose in the pasture (and a couple times I actually did), but my dad always knew how to change my mind. I never had a cooler room for my calves. I had an old pole barn that was always muddy right in front. I drug panels around that seemed to weigh ten times what I did at the time and tie them up with baling wire. I eventually saved enough money to buy three box fans and hung them in the barn to keep constant air circulation. We mixed our own feed because we could not afford the show ration and clipped our own calves because there was no affording a fitter. But despite all that, I still had people asking how I grew all that hair on my steer one year. Despite all the down falls, lack of riches, and dreaded early mornings before the bus came, I learned so much. Hard work. Determination. Finish what you start and do not give up. Your hard work will be rewarded. My dad left a lot of the work to me, but I think it was meant that way. Had he done the work for me, or had we paid someone to fit my calves, I would have learned that money could buy anything. Sure I could have went out and spent big bucks on a show calf, but then how would I tell the story of getting to watch the calf be born or watching it grow as a calf? How would I have learned those lessons of what hard work can do? I attended an FFA meeting last week to show members and families that there are people in the community who are not parents, but are still interested in supporting youth in the program. The program has grown and centered around stock shows. Spends thousands upon thousands of dollars to purchase and care for show stock so the youth can travel all over Texas and win the big scholarship money. I am not saying that is a bad thing. The show circuit is a great place to learn, but it is when you are wrapped up in the winning and money that you forget everything else. What about the Career Development Events, Supervised Agricultural Experience Programs, learning the Creed, speaking events, leadership opportunities, and networking events? When you get wrapped up in the winning and forget about the learning experiences, that is when something has gone astray. Did you participate in youth programs in your area? What are some of your most memorable trips, events, or competitions? Share your story with us connect with others through the I am Agriculture Proud Facebook group or leave a comment here. Your experiences in 4-H and your views sound a lot like mine. I showed horses and dogs, though. I distinctly remember the first few years, when it felt like I was the biggest loser, showing up with my unregistered mare, knowing nothing about how to groom or show. But knowing how to feed and care for her, as it was my sole responsibility. But thanks to a lot of kind volunteers and sweat equity on my behalf, over the years I ended up winning showmanship awards at our county fair. 4-H and FFA have been invaluable to me, and have made me the person I am today. The biggest lesson I have learned from 4-H is that ANYONE can do ANYTHING as long as they are dedicated and willing to work hard and learn. Also that every situation and every person can teach you something! Now I’m married to a beef and hog farmer and we have 3 small children. We could easily afford to buy the expensive calves and go through all that, but will not. Our kids will, like you and I, will have to do the work and show the effort. That is the only way to truly learn anything and get anywhere in life, by doing it yourself!